George Beier and Cecilia Rosales are challenging incumbent Kriss Worthington for the District 7 seat he has held for 14 years. Assistant News Editor Stephanie Baer talks to reporter Rebecca Xing about the three candidates for Berkeley city coucil come November 2010. With two weeks left in the nomination period for the Berkeley City Council elections, the fight for District 7 has already raised quite a stir as two heavily backed candidates have stepped up to challenge Councilmember Kriss Worthington for the seat he has held for the past 14 years. Districts 1, 4, 7 and 8 - occupied by incumbents Linda Maio, Jesse Arreguin, Kriss Worthington and Gordon Wozniak, respectively - are up for the Nov. 2 elections, and at the halfway point of the month-long nomination period, none of the districts are left uncontested. The implementation of ranked-choice voting in this year's election has altered the normal dynamic of Berkeley politics and has allowed Mayor Tom Bates to endorse two different candidates running for Worthington's seat - George Beier and Cecilia Rosales. "I would hope people rank them one and two, either Rosales first and Beier second or Beier first and Rosales second - it doesn't matter ... it's time for new representation and new energy in the seventh district," Bates said. "It's good because with rank voting, somebody has a really good chance of unseating the incumbent Worthington." Worthington, who was first elected to District 7 in 1996, said if the right person comes along before the nomination period ends he will drop out in support, though he said such a candidate has not yet appeared. "George (Beier) has the neighborhood part down and (Rosales) has got the progressive part down, but neither of them has been a strong advocate for students, who make up the biggest single group in our district," he said. "They have their good points, but they don't have good points on important components of the job that I do." Beier, who ran for the District 7 seat twice before, has been endorsed this time around by several city officials including Bates, former Mayor Shirley Dean and Councilmembers Laurie Capitelli, Susan Wengraf and Wozniak. Beier, a graduate from the UC Berkeley Haas School of Business who started a small mortgage software company called Loansoft, is currently the president of the Willard Neighborhood Association and participated in the effort prevent the closure of the Willard pool. "George is much more gregarious, a better people-person than I am," Wozniak said. "The main thing is he would bring these technological skills and broad business knowledge that would really help get the city into the 21st century." In 2006, Beier lost by a margin of about 200 votes. 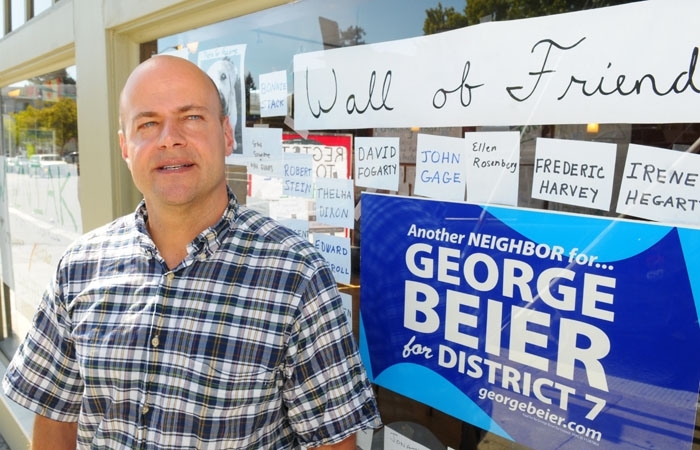 This year, Beier gained more support from the neighborhood communities, he said, adding that he has new ideas for District 7, including revising the zoning ordinance of Telegraph Avenue and increasing usage of People's Park by expanding an ambassador program to help drug addicts in the park recover. "I don't believe for a second that what we have here is permanent," he said. "I think it's changeable, I think it's fluid and I think with leadership you can fix it." Rosales, who has a degree in communications from the University of Philippines, started her own small business called ZesTop Design in San Francisco and is an elected member of the Alameda County Democratic Central Committee. "There are a lot of empty storefronts," she said. "It used to be the reason people come to Berkeley. Now visitors comment on how disappointed they are with Telegraph. I hear them say 'I don't want to go there again. It feels unsafe.'" Rosales has been endorsed by Maio, though Worthington has come out in support of Maio. "I'm not supporting Kriss Worthington," she said. "He's done some good things, but I'd like to see a different approach. I know Kriss is supporting me and I'm pleased to see that, but I'm afraid that I won't be able to reciprocate." Rosales has also been endorsed by several local California Democratic Party officials and, due to ranked choice voting, Bates. Under the new system, voters rank up to three candidates, who must receive a majority of votes to win. Once the first-choice votes are tallied, if no winner emerges, the candidate with the least votes is eliminated. The eliminated candidate's first-ranked votes then go to the second-choice candidate, and this may happen a second time if the condition to win is not met. Worthington's ally on the council, Arreguin, said there is an effort to eliminate minority voices within the council, a group that includes both himself and Worthington. "Because of our outspoken progressive advocacy, I believe that Mayor Bates and some of his supporters, his allies, are motivated to try to unseat Kriss Worthington," Arreguin said. Though Bates has not endorsed a candidate for District 4, he said he is solidly supporting incumbents Maio and Wozniak. As of press time, Arreguin's only current opponent is Bernt Wahl, an entrepreneur, Fulbright fellow and UC Berkeley industry fellow at the Center of Entrepreneurship and Technology. Maio is up against the youngest candidate, 22-year-old Jasper Kingeter, and Wozniak faces small-business owner Jacquelyn McCormick. While Bates said the election season usually heats up after Labor Day, candidates are currently focusing on raising funds to sustain them until November and recruiting volunteers to help campaign. With the addition of ranked-choice voting, this year's elections are less predictable. "I don't anticipate anyone will get 50 percent of the votes the first time around, so rank voting will kick in," Bates said. "It will be interesting to see how it plays out."